For more details on glyphs, see Castlevania: Order of Ecclesia/Glyphs. 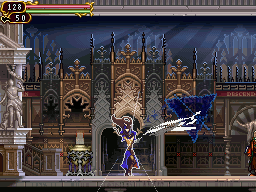 Unlike previous Castlevania games, Shanoa's main attacks are glyphs. She has three glyphs: main glyph, sub glyph, and back glyph. Main and sub glyphs are attacks, while back glyphs are usually supportive. Each glyph uses a certain amount of MP, but MP recharges quickly when not attacking. Each glyph is also associated with a specific attribute. Glyphs can be obtained in several ways. Some randomly appear after an enemy is defeated. Some can only be absorbed when an enemy is using a glyph. Others can be found in statues. Glyphs are absorbed by holding . Each glyph absorbed adds 1 point to all attributes and replenishes 10 hearts. By pressing and either or , a glyph union will be performed, which is a stronger attack. Glyph unions cost hearts instead of MP. Attribute points are gained when enemies are defeated with glyphs. There are six attributes: slash, strike, fire, ice, lightning, darkness, and light. The more points gained, the stronger the glyphs become. There are four status effects that Shanoa can experience. Drains HP and lowers stats. Shanoa becomes immobile. Keep tapping the Dpad to break free. Same with Stone. But cannot break free with just tapping until you get hit again. For more details on equipment, see Castlevania: Order of Ecclesia/Equipment. For more details on use items, see Castlevania: Order of Ecclesia/Use Items. A variety of items can be found throughout the game. Shanoa can equip a head gear, body gear, leg gear, and two accessories. There are also several use items that replenish either HP, MP, or hearts. Many use items don't have a functionality other than a requirement for quests. Throughout the game are five kinds of chests that contain various items. Each chest can only be opened once, except for wooden and green chests. They can be opened each time after revisiting a map. Each map has a set pool of items which the wooden and green chests randomly select from. Wooden chests contain a random common item. Green chests contain a random rare item. Red chests usually contain a max up item. Gold chests contain a relic. Blue chests are hidden and can be revealed by pressing . Each map has several save rooms where you can save your progress and restore HP and MP. Warp rooms transport you to other warp rooms that you can select on the map. Press to interact with them. This page was last edited on 5 September 2015, at 06:25.